While he is very much the traditional politician, whose sheen has been corrupted, whose approach to policy merits suspicion, Israel’s Benjamin Netanyahu was happy with US President Donald Trump. Trump had just given a rousing display of realpolitik before the United Nations General Assembly, though it was less a case of Machiavelli than an instance of plain, boardroom mannered bullying. America First had made its boisterous debut, and Israel was not going to miss out. Certainly not Sara Netanyahu, who decided that watching Trump in action (a good “friend” of the family, as is constantly reiterated) would be far better done in the first row of diplomats rather than the balcony, where Trump’s wife was left. This pabulum had to begin with the language of drama, one suggesting that anything personal in the prime minister’s life was bound to be globally significant. Israel was facing a revolution in its “standing among the nations.” Countries had suddenly “woken up” to Israeli prowess, its throbbing inner genius. Israel, the “innovation nation”, the miracle worker in agriculture, cybersecurity, medicine, autonomous vehicles. And leaders of the world were curious, wondrous, delighted. They came to see for themselves, to taste the heavenly manna and drink its magical waters. Trump had visited in May and stood at the Western Wall – “and when the president touched those ancient stones, he touched our hearts forever.” Then there was the visit by Indian Prime Minister Modi – more Israeli ingenuity on show. It also followed that the Israeli leader would be something of a jetsetter too, racking up his frequent flyer ledger. Africa featured (“Israeli innovators increasing crop yields”); Asia (the deepening of ties with China and Singapore); and advancing cooperation with Azerbaijan and Kazakhstan – moderate Muslim states, of course. The time for a comic turn was nigh. “One year, six continents.” But what of Antarctica? Yes, the good prime minister was hoping to visit the continent of ice having “heard that penguins are also enthusiastic of Israel.” They had little difficulty acknowledging “that some things are black and white, are right and wrong”. Remarkable. 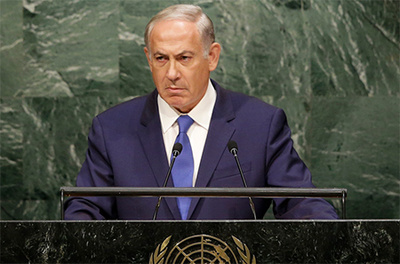 Nentayahu could not avoid returning to a theme so worn it is falling off its hinges: the Iran nuclear deal, the perception that any arrangement with Teheran made with the international community must smack of conciliatoriness to the death dealing mullahs. Be wary of the sunset clause on restrictions placed on them; be wary of a nuclear-armed Iranian-Islamist empire. It was, according to Yossi Verter in Haaretz, “the black against all the shining white that is modern, innovative Israel, whose seawater the Indian prime minister drank two minutes after it had been desalinated.” As for the Iranian deal, it was fix it, or nix it. But things have not been going well for Netanyahu. While attempting to keep the show smooth and going on the international road, his domestic affairs are suffering. One version of this is offered by Yoaz Hendel, a soft variant that almost comes across as fawning, apologetic, sympathetic. While performing in New York, Netanyahu was evidently fronting for his audience in Israel, attempting to shore up sliding positions with is pitch to greatness. Members of the law are keeping an eye on him, those in the Justice Ministry mulling over whether he is worth charging over instances of corruption, abusing former household staff or a scandal over deposits on empty bottles. A truly motley array of positions, then. Netanyahu, the potential suspect pleading for mercy; Netanyahu the great statesman and head of an enterprising, indestructible society thriving against the odds; Netanyahu the wise crack specialist with an inner knowledge of a penguin’s moral compass. And Netanyahu the singer of praise for a certain Donald Trump.